When preparing for an Initial Public Offering, businesses need a way to securely store and share critical business documents with a variety of individuals ranging from bankers and attorneys to company investors and internal team members. In this case study we will discover how Inogen, Inc. used a SecureDocs Virtual Data Room to share their most valuable corporate data and streamline their IPO process. Inogen is a medical technology company that develops, manufactures and markets innovative oxygen concentrators used to deliver supplemental long-term oxygen therapy to patients suffering from chronic respiratory conditions. Inogen needed a solution that would allow them to share their information with various people who needed access to different subsets of information, and it was imperative that Inogen remained in complete control over the security of their documents during the process—ensuring complete transparency into who was doing what with each document and when. Having been a privately held company for over a decade prior to their IPO, Inogen’s executive team knew that over time the business had accumulated an exorbitant amount of corporate data. In preparation for their IPO the team recognized that they needed a way to securely organize, store, and share that information—both with internal and external parties—from one centralized location. They knew that the information they needed to share during their IPO was the lifeline of their business, and included their most proprietary data. So, they didn’t take choosing their virtual data room solution lightly. 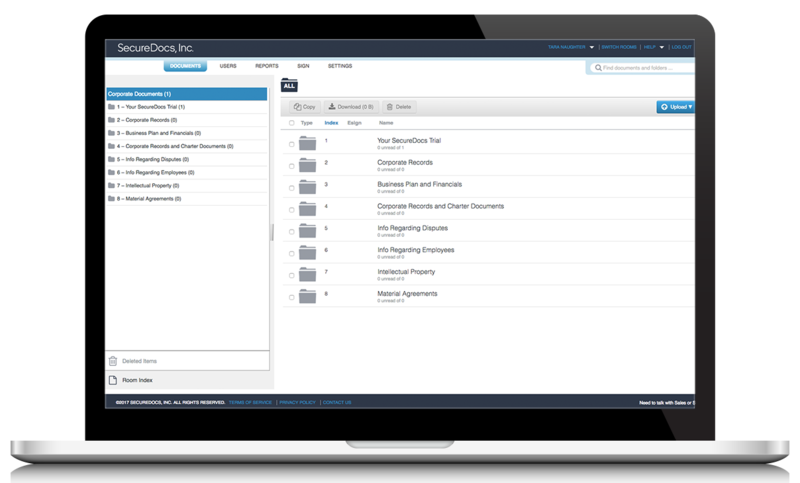 The team did their due diligence before deciding a virtual data room provider, looking into various other solutions before choosing SecureDocs. What they found was that the security and features offered by SecureDocs were not merely on par with those offered by the larger, more traditional firms used during IPOs, but in many cases were much better in terms function and usability. SecureDocs gave Inogen insight into what specific bankers, lawyers, and other key personnel were doing with the information they were provided. Understanding which documents they were viewing and how frequently they were viewing them allowed Inogen to feel confident that all parties were seeing everything that needed to be seen without the hassle of having to frequently check in with each individual. With SecureDocs, Inogen was able to set up permission-based user roles, customizeable NDAs, dynamic watermarking, and activity alerts on key documents in their data room to streamline their successful $70.5 M IPO. Today, Inogen uses SecureDocs as a secure online repository for their company’s most critical corporate documents. Storing all of their key documents in one centralized location creates efficiency for the now public company that would not otherwise exist. The drag and drop feature in particular allows for new PDF, Word, PowerPoint and Excel documents or folders to be uploaded and indexed quickly and securely before giving specific types of access to only those who need it.